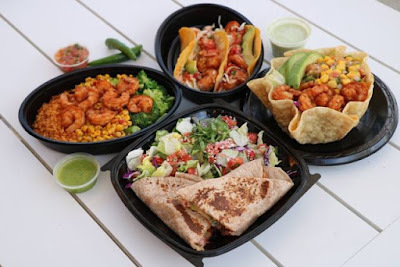 El Pollo Loco introduces four new entrees featuring Baja Shrimp just in time for the 2018 Lenten season. - Shrimp Avocado Plate - Two tacos, each consisting of Baja shrimp, avocado, Baja sauce, cabbage, and pico de gallo folded in a warm artisan tortilla. - Shrimp Tostada - Baja shrimp, avocado, mango salsa, beans, rice, and cheese in a crispy tostada shell. - Shrimp Bowl - Baja Shrimp, broccoli, and corn served over seasoned rice. - Shrimp Wrap - Baja shrimp, avocado, Baja sauce, cheese, and pico de gallo folded in a wheat tortilla. Served with a side salad of lettuce blend topped with pico de gallo, cotija cheese, and cilantro.